I have spent today in the kitchen but most of it was not preparing meals. It was about making and bottling jam and sauce. There were 6kg of cherry tomatoes squirreled away in the freezer ready to make sauce and today was the day. The recipe for the sauce is here. Next up was the 10kg bag of onions I bought yesterday. I set 2kg aside for a friend and then sliced and diced another 7kg and have packed and frozen them. 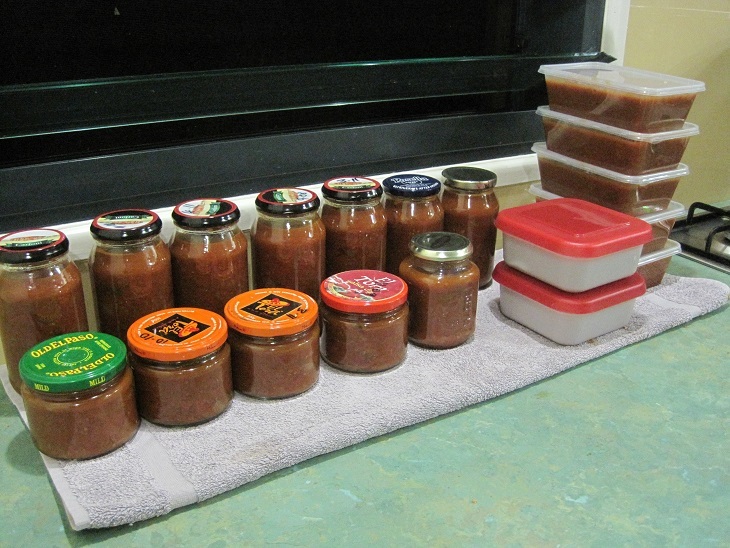 I decided to turn the last kilogram into onion jam and the taste test indicates that it has been successful. The recipe I used had carraway seeds in it so I bought some this morning when were shopping. I have never bought carraway seeds before but if it looks as though I will be making onion jam in the future I will definitely get some more. Finally, I made some plum jam which is GMan’s favourite. It turned out better than the batch I overcooked last year which was closer to toffee than jam! Place in saucepan, boil until setting point is reached. The stones can be removed with a slotted spoon during cooking. 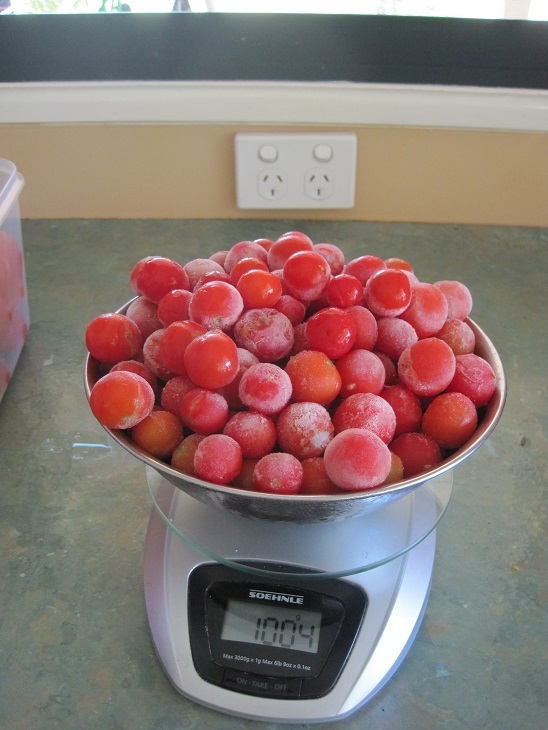 Tip: Count the plums before you start so that you know how many stones you are trying to remove. I also made another batch of spreadable butter. Here is the recipe. The only problem with cooking all day is that I did not get the ironing done! However, we do have ironed clothes to wear to work tomorrow. I apologise for the break in posts but my computer access has been somewhat curtailed due to some repairs to the main computer. It is all resolved, thanks to the local computer shop, and we are back in business. Today I want to share my latest success in preserving our bumper harvest of cherry tomatoes. After removing the stalks and rinsing the tomatoes, I blitzed them in the blender. My dehydrator has solid sheets for making fruit leathers so I poured the resulting puree onto the sheets. Here is the same tray after drying for about 8 hours. I removed the dried tomato and broke it up. It was quite leathery and pliable so still had some moisture. 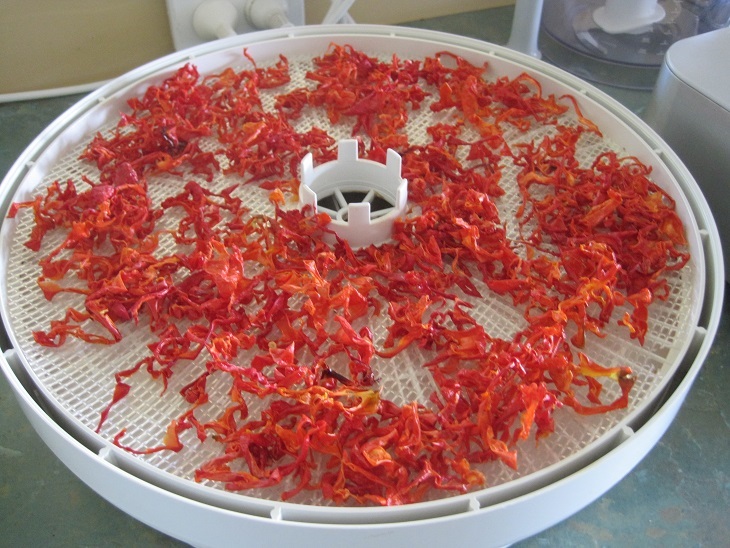 I returned the pieces to the dehydrator and dried them some more. Finally, I ground the dried pieces in the blender and this is the result. 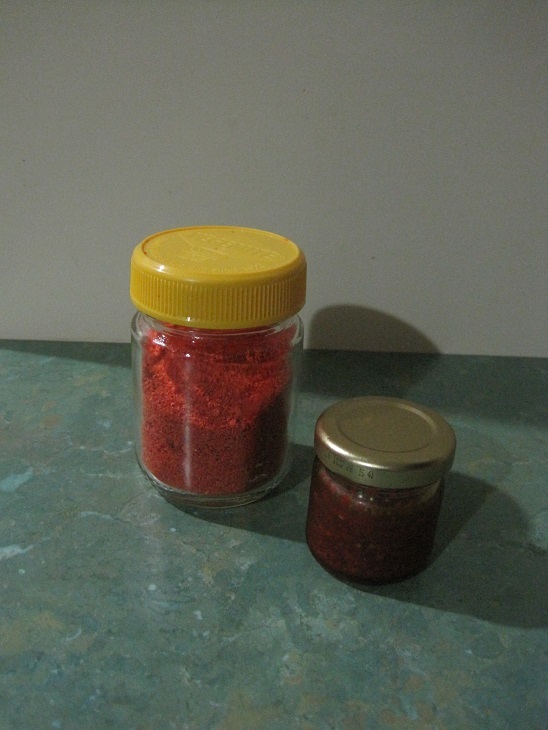 From a couple of kilos of cherry tomatoes I have 1 jar of powdered tomato concentrate. This can be blended with water to make tomato paste which I can use on pizzas or added directly to casseroles or soups. I am sure there will be a hundred and one uses for it and the great part is that I have a single jar which stores easily in the door of the refrigerator. Here is a post from 3 years ago when I first tried my hand at making Tabasco sauce. It was a great success and the quantity lasted for a couple of years. Unfortunately, the chilli bush did not survive the changes to the vegie garden area so we bought another one in the middle of last year. Today I am making more sauce and using just half of the quantity stated in the original recipe. This has to be one of the simplest preserving recipes around. I am looking forward to having a bottle on hand so that I can add a couple of drops to various dishes that I make. Six months ago I watched on wistfully as my Northern Hemisphere blogging friends struggled to bottle, preserve and freeze their abundance of tomatoes. It was winter here, and although the ground is not covered with snow, it was far too cool to be thinking about growing tomatoes, let alone harvesting them. I hoped that my turn would come, and sure enough, it has. 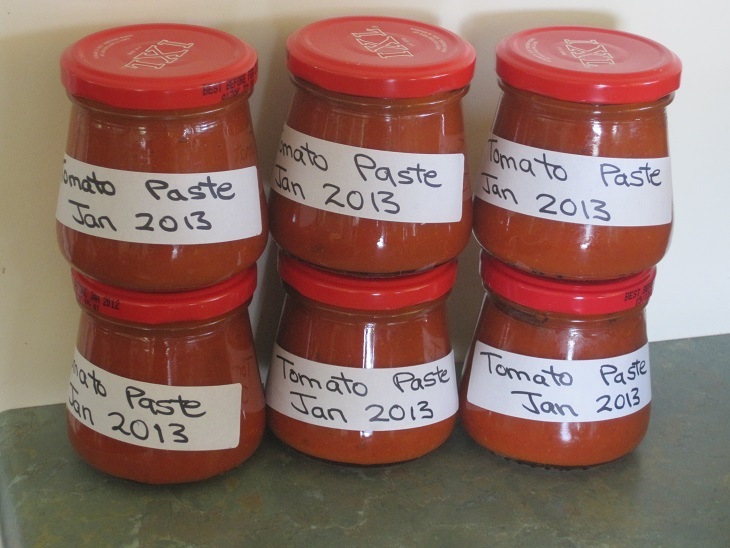 A couple of weeks ago I made tomato sauce and blogged about it here. As well as the wild cherry tomatoes we are growing Roma tomatoes for the first time and they have been a runaway success. 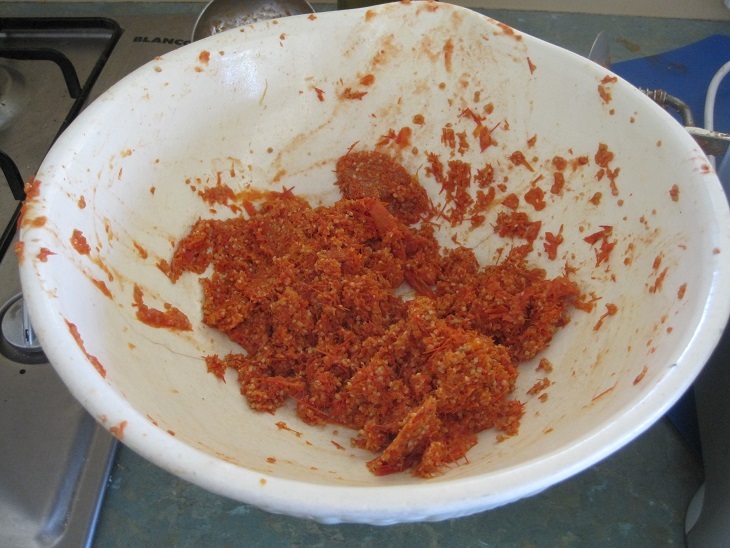 The next tomato project I decided to try was tomato paste. As usual, I found several recipes on the internet, compared them and then made it to fit my available ingredients and quantity of tomatoes. The site which I referred to most is here. You will see that I used much less oil than suggested. Also, please remember not to mix up pounds and kilograms. I used 5 kgs which is 11 pounds. 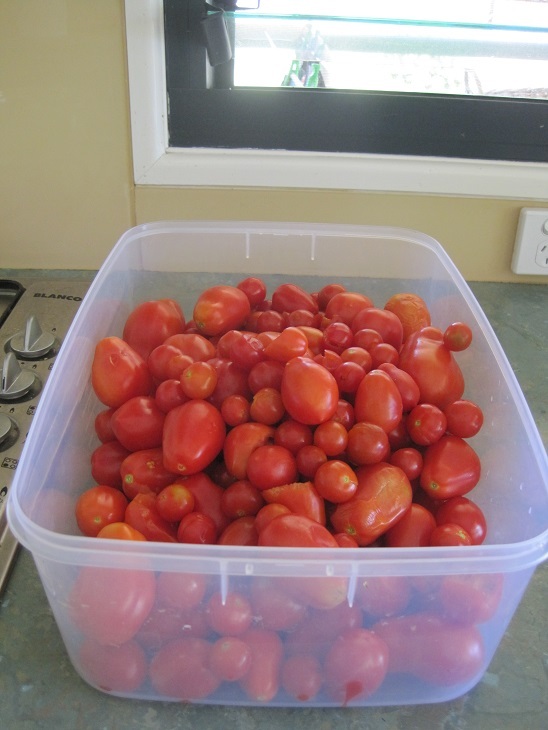 These are 4kg of Roma tomatoes which I picked yesterday. And another 1kg of cherry tomatoes which I had in the freezer. 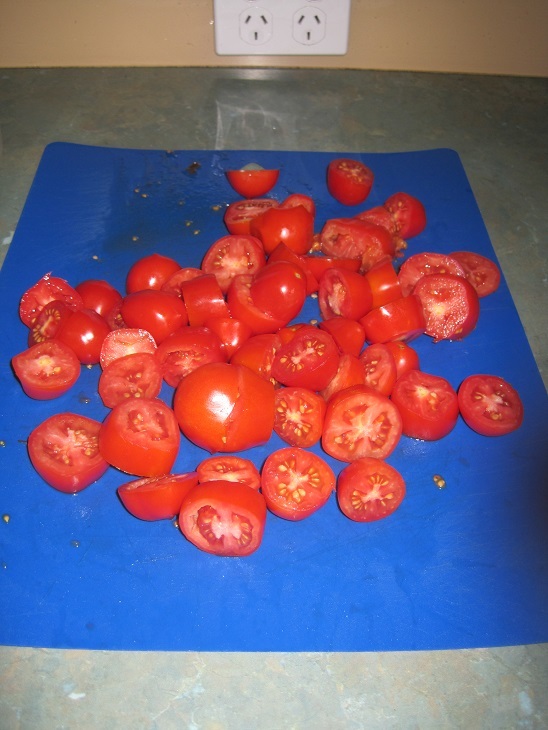 I roughly chopped the Roma tomatoes. 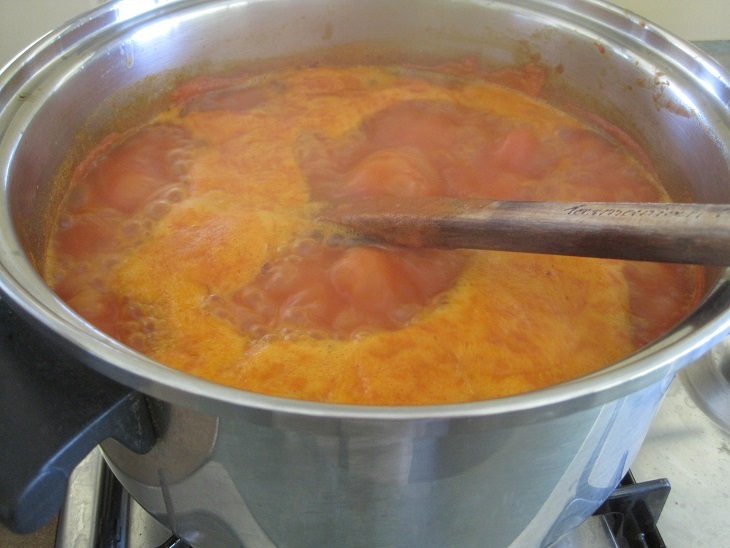 5kg tomatoes, 125ml olive oil and 1 & 1/2 teaspoons sea salt into the stockpot and simmer for about 10minutes. 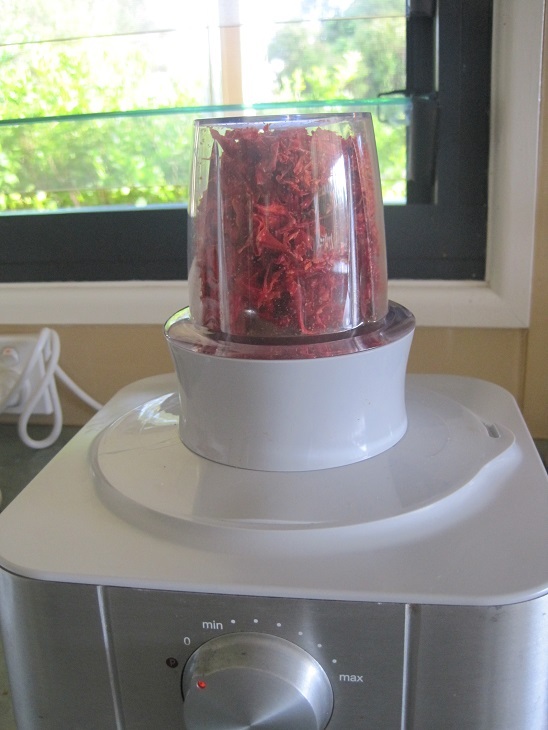 Then it is time to put all of the liquid and tomatoes through a food mill. 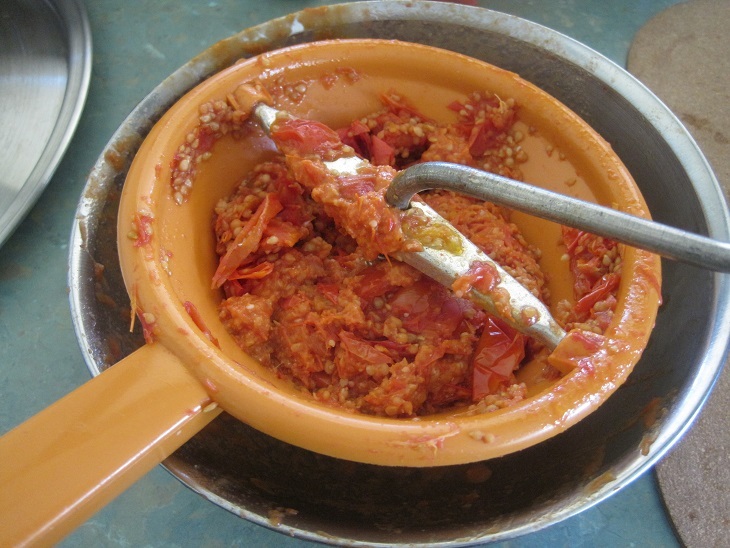 All of the liquid and puree went into a large saucepan and the skins and seeds into a separate bowl to be discarded. Simmer the liquid for 1 – 2 hours or until reduced and thickened. 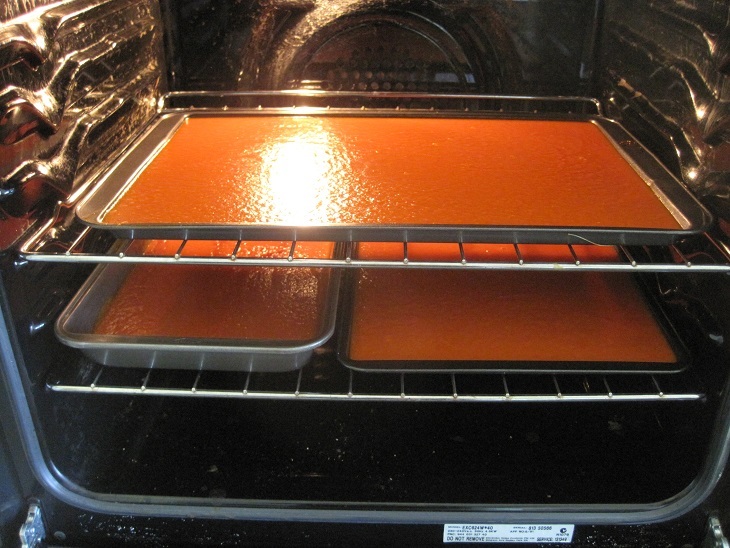 Pour the thickened puree into shallow oven trays and bake in the oven at 180C for 30 minutes and then for another 30 minutes at 140C. Check the mixture about every 15 minutes and be sure to stir any caramelised bits on the edge back into the middle of the puree. 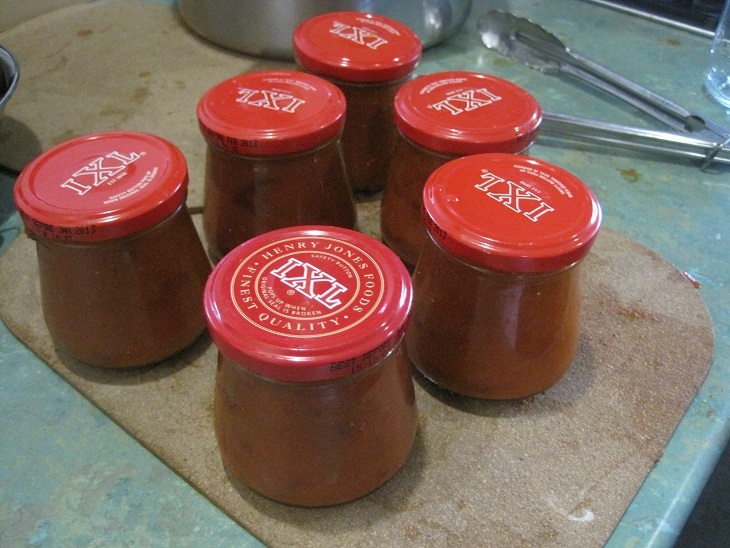 Transfer the paste to hot, sterilised jars. Be sure to tap the jars to remove any air bubbles as you pack it in. Place the lids on the jars and process in a hot water bath for 30 minutes. For your health and safety, please refer to more detailed instructions about hot water bath processing. Remove the jars, allow to cool and check that the vacuum seal is intact before storing them. This is an easy but somewhat time-consuming process. 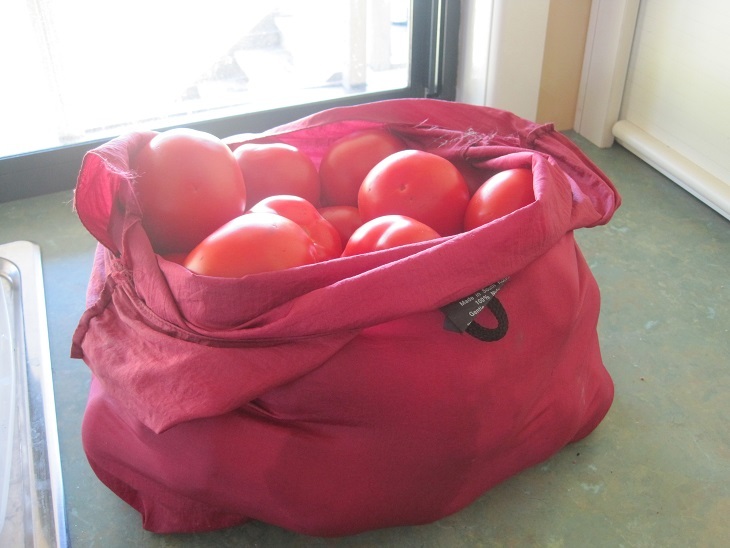 It is a great way to be able to store a large quantity of tomatoes for later use. 5kg of tomatoes made these 6 small jars plus a couple of spoonfuls that I have in a container in the refrigerator which will be used in the next day or so. The harvest continues. 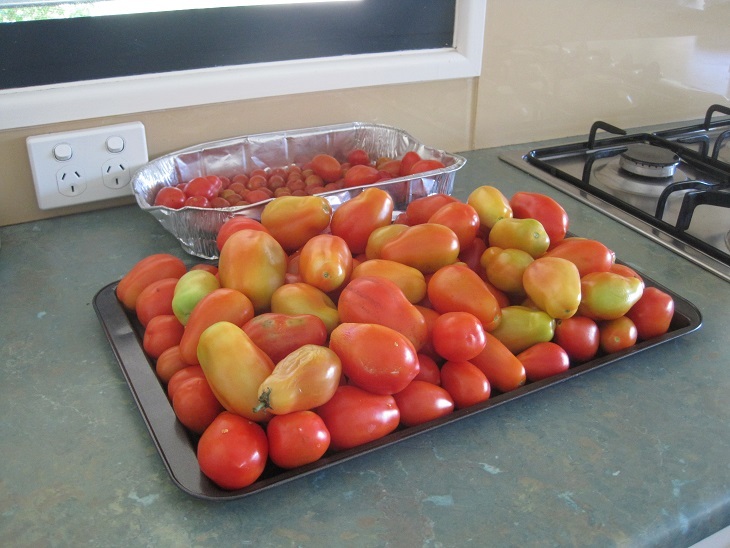 Here are more that I picked today and there are still heaps more of the Roma tomatoes on the bushes. 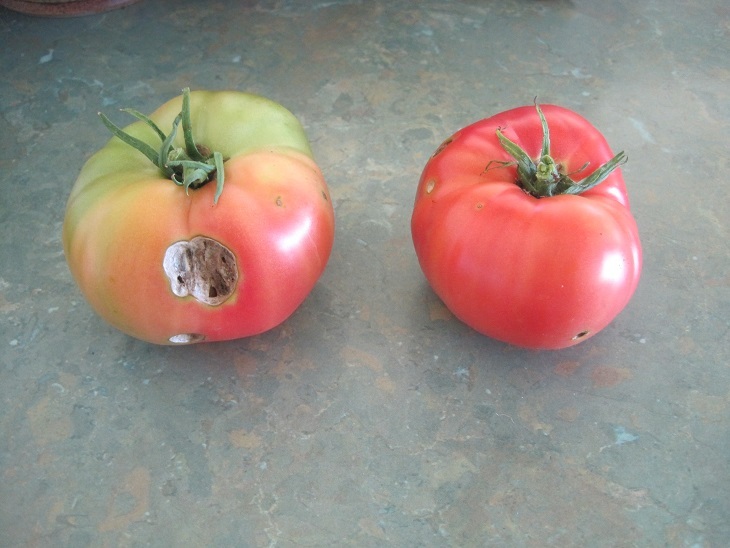 Finally, here are the first 2 full-sized tomatoes that I have grown for several years with plenty more to come. I cannot remember what variety they are. They have some imperfections but those can easily be removed. And one final photo for Mrs Thrift from Not Just Green Fingers who asked how we managed to garden in the heat we are having. I live in an area of Australia where we have a more temperate climate due to the elevation and also a good rainfall. In fact it is sometimes more than we need. However, the last 6 months have been particularly dry and very hot for the past week. 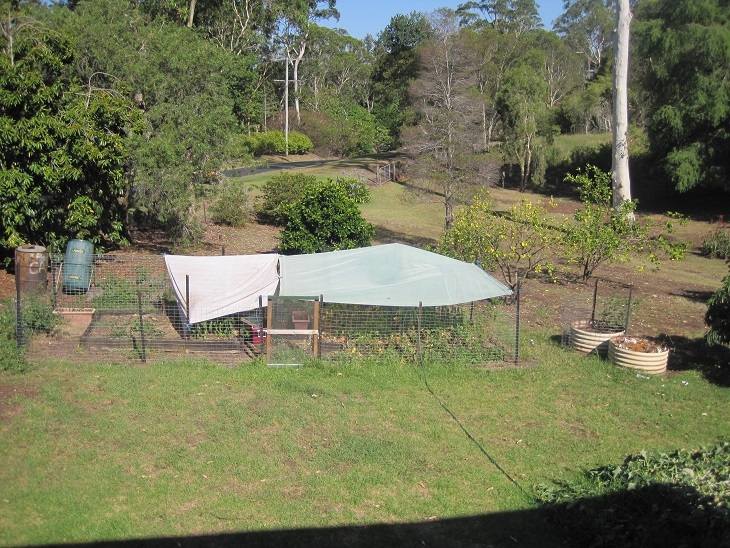 The tomatoes and red peppers have coped well but with more hot weather forecast I decided to rig up some protection for them today. The main covering is a large piece of shadecloth which came from my parents’ home. It has timber frames at each end and eyelets in the corners so was very easy to attach to the star pickets at the corners of the fence. The extra piece is an old curtain (very thin) which is covering the peppers. Despite the heat we are still managing to produce some of our own food. There are plenty of chillies, we also have figs and peaches. The fruit are unfortunately attacked by fruit fly but I salvage what I can even if it is just one bite. I am going to see if I can rescue enough peaches to perhaps preserve a bottle or two to enjoy in mid-winter. The first cantaloupe was picked yesterday because the side that was touching the ground had started to rot. It was a little early so not superbly full-flavoured but I diced it up and mixed with some locally grown pineapple was very enjoyable for breakfast. Do you have anything growing in you garden at the moment? How do you cope when you have a glut of a particular fruit or vegetable? I have had a very productive weekend. Following on from yesterday’s post about the Tabasco sauce I wanted to show you my other achievements in the kitchen. The bell chillies were dried and the 4 trays of sliced chillies ended up reducing to this. I then ground them in the spice grinder attachment for my food processor. This is what I ended up with. 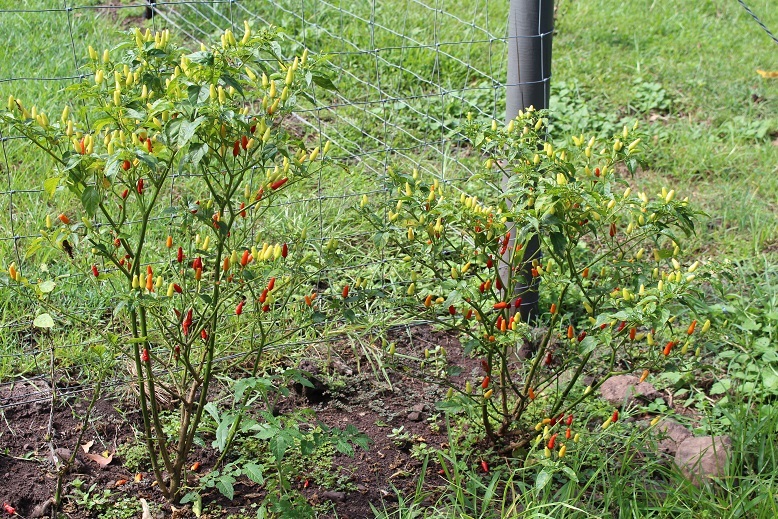 45g of powdered chilli – grown about 20 metres from the back door with no chemical sprays. The smaller jar is the residue after I had sieved it mixed with some avocado oil. I will use the chilli oil to add a little bit of flavour when cooking. Today we went to the Caboolture Markets. I bought the fruit and vegetables that I needed as well as 9kg of tomatoes. These were being sold for 99c/kg so I filled my Ecosilk bag. I decided to make tomato pasta sauce that I will be able to use in a variety of ways. The ingredients are tomatoes, onions, basil, tomato paste and red wine. The onions were from our crop last winter which were diced and frozen, the basil from the garden, tomato paste and red wine from the cupboard. I forgot to take any photos as I was working flat out to get this done this afternoon but here is the end result. The sauce in the plastic containers will be frozen and the jars of sauce were processed in a hot water bath so they will be stored in the cupboard. This was my first attempt at processing anything in a hot water bath. I am confident that it has worked well as the pop-tops have all been vacuum sealed. I am definitely going to do some more research and learn more about this method. It means that I can preserve food without using the freezer and being reliant on a consistent supply of electricity. There is also a small matter of available space in the freezer, too. Any tips or recommendations of resources on preserving would be appreciated.